Rinse your pet's eyes with water, as most animals are sprayed in the face. Mix together 1 quart of hydrogen peroxide, one-quarter cup of baking soda and 1 or 2 teaspoons of grease-cutting mild dish soap. Double this recipe for a large dog or pet, or if your smaller pooch was sprayed over a large area of her body. Apply the mixture directly to the sprayed area of your pet. Work it in, lather it up and get down to your pet's skin and throughout his coat. Use your fingers to massage it in. Keep the solution away from his eyes. Leave the solution on for 20 minutes. 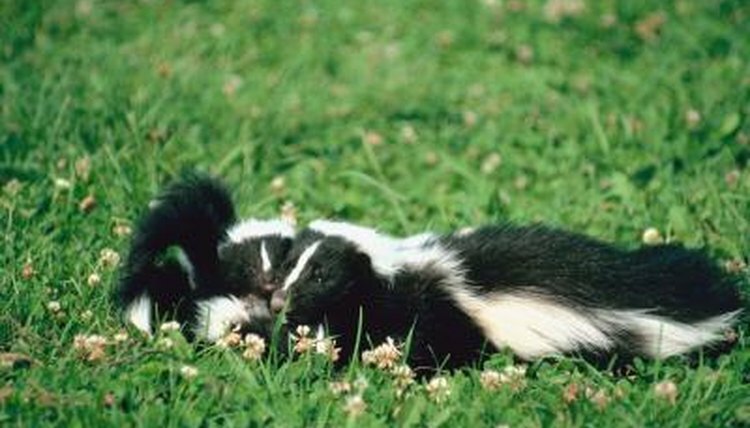 While this is a long time, especially for most common pets, the solution needs to sit to break down the oils of the skunk spray. Confining your pet to a small area may be useful. Rinse the solution off your pet and wash him with his regular bathing shampoo.